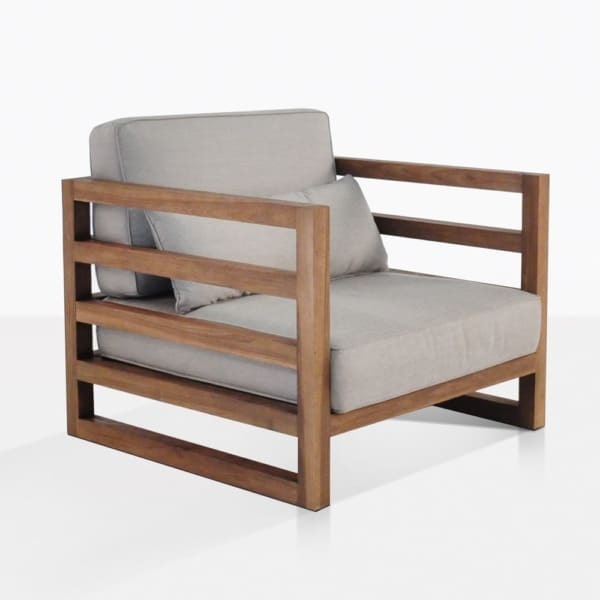 The Outdoor Club Chair from the Manhattan Collection is a new take on teak. This sturdy, modern club-style outdoor lounge chair is made with reclaimed teak that has been finished in a sophisticated looking dark walnut stain to give it a cool new look. This piece works well indoors with other finishes around the room. This club chair comes with Dove colored cushions as shown. W33" x D34" x H31"
This contemporary outdoor club chair is clean looking and has a distinctive square look, with nice sharp angels and a simple linear design. The Sunbrella® cushions (included free of charge) allow for long lasting good looks and comfort, especially when used with the Sunbrella® covered lumbar support pillow. This lumbar support instantly turns this deep relaxing chair into a easy chair to get into and out of. Despite being square with sharp lines, the Manhattan Outdoor Club Chair is quite inviting. The dark colors and the low seat height make it the type of chair you can count on for style and comfort. 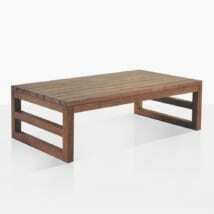 Some would say this style is the perfect way to balance the feel of teak in an indoor setting. Others might point out that the materials were made for the outdoors, with the fade resistant fabrics and the inherent natural qualities of the teak. Because this contemporary club chair does not fall squarely into a specific design category, it gives you a lot of options on where to place it and with which furniture. The contrast of this piece with rounded items (take for instance the side tables in the Manhattan Reclaimed Teak Furniture Collection) is excellent. Low to the ground and deep for extended relaxation; this chair really does offer a lot of flexibility with the high arms and the lumbar support. It’s because of these parts that the chair is easy to use and remove yourself from. There is a certain nostalgia that comes with reclaimed teak and the darker walnut tones, but it is not overshadowed by the definitively “current” feel of this contemporary teak outdoor club chair.